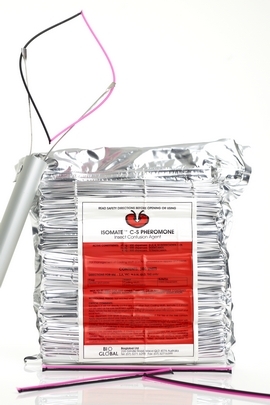 Isomate C-Strap excels as a sole treatment against low populations of codling moth (Cydia pomenella) and in combination with a reduced insecticide program where populations are high. In Australia, Isomate C-S is registered for mating disruption use on apples and pears. It is completely harmless to non-target insects meaning more beneficials for the control of mites, aphids and other pests. Isomate C-S allows growers to produce premium quality fruit with little or no insecticide after petal fall.